Preschool series. 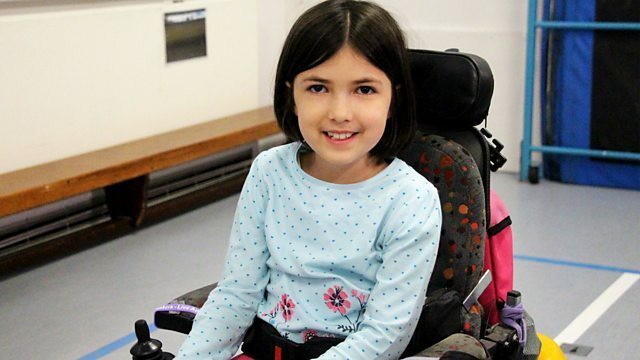 Let's Goer Millie talks about her wheelchair dancing! Browse content similar to I Ballroom Dance in My Wheelchair. Check below for episodes and series from the same categories and more! I Love Playing Music On My Piano! This is the Let's Go Club, but mini! so get ready for more fun from the Let's Go Club. Hi, my name is Millie. ..and I like drawing pictures. This is my brother Benny. We really like to make videos of ourselves telling jokes. Millie, why do seagulls live near the sea? I don't know. Why do seagulls live near the sea, Benny? Because if they lived near the bay, they'd be called "bagels"! There's one thing I love doing - wheelchair dancing. When I'm at school, Mrs Jones helps me with my standing frame. I have lots of fun with my friends when I'm here. to help me with my wheelchair skills. and to move safely around each other. This dance is called the waltz. and turn with them, side to side. And we get to freestyle so we can do any moves we want to. You can get to go really fast when you're freestyling. I used to get nervous, but now I really enjoy it. Everyone gets together and we show off our skills to each other. And I get to dance with my friends, just like this. I love dancing. We have such a great time. I am Millie, and this is what I do. You can join the Let's Go Club, too. Grab a grown-up and head to the CBeebies website. Remember, we're the club that never closes! Let's Goer Millie tells us all about her wheelchair dancing! This is The Let's Go Club, but mini! Expect making, exploring, super-sizing, dancing, fact-finding and laughing.